Honey is a great source for a variety of health benefits and what better way to treat yourself and your body than consuming it straight from the honeycomb! Natural honeycomb provides the most raw and unprocessed form of honey that can be consumed and used in a variety of ways. 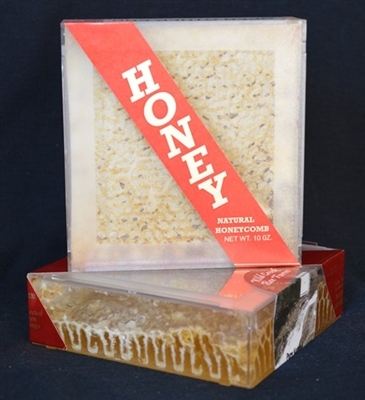 Cut off a piece of real honeycomb to spread on toast or consume it entirely, wax and all, to satisfy your sweet tooth. Our cut comb honey comes carefully packaged and ready to enjoy the way our honey bees intended – right from the honeycomb. Real honeycomb is not typically sold in grocery stores or available from most honey producers, but Wild Creek Bee Farm is happy to be able to provide you with a limited supply of unprocessed cut comb honey. We harvest our bee honeycomb from the most productive hives to guarantee that your cut of honeycomb will be dripping in liquid gold!